The world debut for what will be a flagship model, the Audi A8, will reveal an all-new luxury saloon that will push technology to its limits. In addition, the car will have full driving automation and Audi says that its new design language will be rolled out across the range. On board, there is a pioneering touch operating concept and from 2018, the A8 will be available with piloted driving functions. 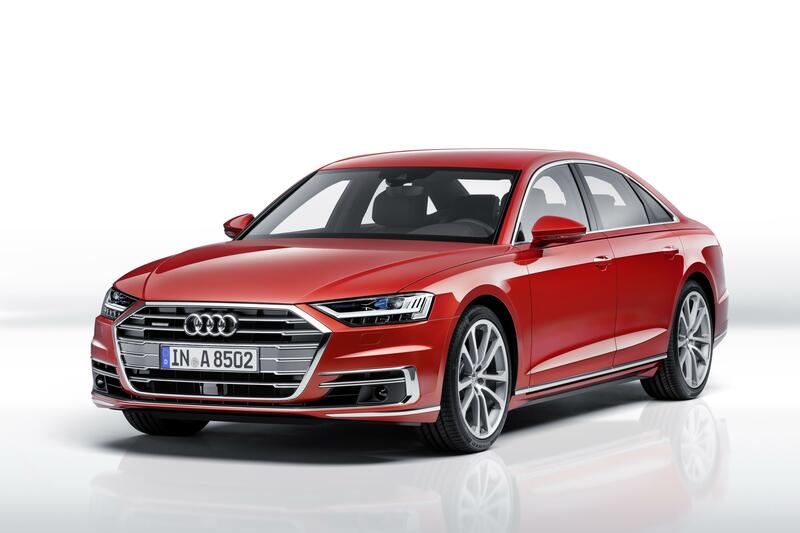 Indeed, the carmaker says its Audi A8 will set the benchmark across a number of categories and it is, they say, the first production car that’s been developed for highly automated driving. From next year these will include parking pilot, traffic jam pilot and garage pilot. However, for most Audi lovers, the exterior styling heralds the beginning of a new design for the brand. The muscular body has a new front end and the new model is longer and wider than the one it replaces. Audi says the new A8 will offer levels of luxury for drivers including new seats, ambient lighting and the interior cabin has been completely redesigned. The Audi A8’s new instrument panel is free of switches and buttons and instead consists of 10.1-inch touchscreen display which when it is switched off blends with the dashboard to become invisible. The touchscreen display also uses fingertip control to access the air conditioning and other comfort functions and the A8 also uses voice control – with the driver able to communicate with the car and ask for directions to a destination. Audi have also introduced traffic sign recognition as well as hazard information with a navigation system that self learns, particularly if it follows a route on a regular basis – and can offer the driver intelligent search suggestions. However, most drivers will be taken with the system which takes over the car in a traffic jam at speeds of up to 37 mph to deal with the accelerating, braking and steering. The driver now no longer needs to monitor their car permanently and can take their hands off the steering wheel. Depending on the local laws, the driver could, for instance, start watching on-board TV while the car deals with low speed traffic situations. The Audi A8’s parking and garage pilot will steer the vehicle into and out of a garage or parking space automatically – and the driver does not need to be sat in their car while it does so – they can watch the car’s manoeuvres on the new myAudi app. Available to order from September, the new Audi A8 will be delivered to customers later this year. This entry was posted in Car Leasing, Cars, Executive Cars, Luxury Cars and tagged Audi A8, the new Audi A8 by Steve Lumley. Bookmark the permalink.